Summon: You may sacrifice another creature to give Xavara Atronach its power and health. Xavara Atronach is a common Endurance creature card. It is part of the Isle of Madness story set. 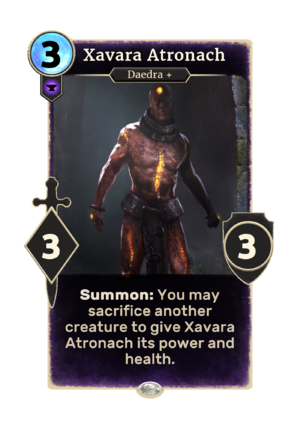 This card's summon ability applies the Daedric Hunger card effect. This card is named after the ruins of Xavara, which previously appeared in the Shivering Isles expansion for Oblivion.